The Beatles (1960-1970) biography and facts. 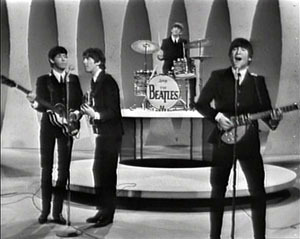 The Beatles promoting their first american hit single "I Want To Hold Your Hand" on the Ed Sullivan Show in 1964, as part of their first US tour. Decades after their their break-up in 1970, the Beatles are still considered as the most influential music group of the pop-rock history. In 2013, their global sales were exceeding 1.5 billion records.